Kakuro is a popular Japanese puzzle, that is particularly suited for Children's puzzles. This is because the grids can be of a wide range of sizes and shapes, from large grids to smaller grids. 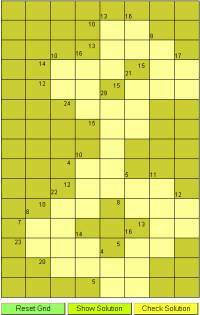 We can supply Children's kakuro puzzles using a range of grids and difficulties, from very easy starter Children's kakuro puzzles upwards.